2012 consolidated on the previous year with five top-ten World Cup results and a personal best end of season World Cup ranking of 11th. In April 2013, Kennedy-Sim suffered an infarct stroke (cerebral infarction). Luckily the stroke was relatively minor and after five days in hospital and subsequent private treatment, she was able to return to light training a couple of months later and eventually return to full training. Early 2014 marked many milestones including a then personal best fourth place in the Val Thorens, France World Cup along with qualifying to the 2014 Olympic Winter Games in Sochi, Russia, where she came 28th and followed up the next month with another World Cup top-ten. Kennedy-Sim placed 12th in the World Championships in January 2015 and the following 2015/16 season stepped up the pace reaching four World Cup semi-finals (placing 6th,7th,7th,7th) as her racing skills and determination solidified. High volume back-to-back Ski Cross racing was introduced in December 2016 with the Cross Alps tour in Europe. Kennedy-Sim matched her previous career best making the final and a fourth place in Arosa, Switzerland and added a silver medal in the Europa Cup in Lenk. Encouraging results throughout the season culminated in February, 2017 at Idre Fjall, Sweden when she stood on the World Cup podium for the first time collecting a silver medal. 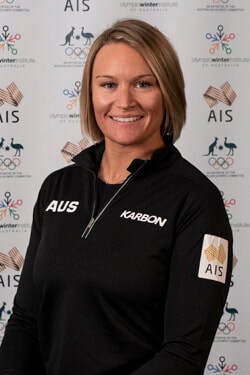 Sami Kennedy-Sim went on to record three more top-ten results (10th, 7th, 5th) before competing in the 2017 World Championships, placing 12th. Making her second Olympic appearance at the PyeongChang 2018 Winter Games, she finished fourth in the women’s ski cross small final. After narrowly missing a spot in the big final, Kennedy Sim’s final result of eighth place in 2018 was an Olympic personal best finish. Proudest moment: Marrying my husband Ben Sim in 2011…...AND standing on the WC podium in 2017! I began Ski Cross in ... 2008 because I needed a change. So I did a Ski cross for fun… and here I am years later. When I am not training or competing I am: Stand Up Paddle boarding, spending time with my family and friends and sampling cafes near by. I enjoy my sport because Anything can happen in Ski Cross. I love the feeling of overtaking someone. Favourite international competition: Blue Mountain, Canada… I love going to an English speaking country after a few months in Europe. Favourite other sport to watch or play: I love to watch Rugby and athletics and love to SUP surf and play touch football. My Hero is: Manuela Berchtold. Australian Olympian, business owner and one of the most generous people I have ever met. She inspired me to get involved with the skiing community more and more.